Doctors at the National Hospital for Obstetrics and Gynecology are daily advising a minimum of 20 pregnant women infected with rubella to abort their unborn child within the first three months of pregnancy. 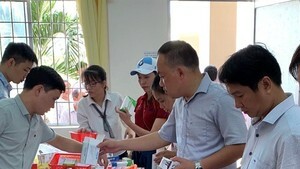 Dr Tran Danh Cuong in the hospital said that since March, the hospital has received over 50 pregnant women infected with rubella every day, 20 of whom have been advised to abort their unborn babies. Recently five babies infected by rubella were born blind, undernourished and with heart malformation. Dr. Cuong said that rubella can be very contagious in the first few months of pregnancy or within the first 16 weeks.